15.5" Size Shown. Snow 200 Model Viola is available in sizes 15 to 16.5 inches. The entire instrument is antique varnished, with a hand-rubbed finish on an Italian spruce top and maple back, for a warm and smooth tone. We sell Snow instruments at Snow prices, however we do certain improvements to these instruments. Most of them come with Eva Pirazzi strings, however at your request and no cost, we can switch the strings for you to the ones of your choice. All instruments come with a professional sound adjustment, valued at $60. For the first year of your ownership, we will do additional sound adjustments at your request, free of charge. All these instruments are completely covered for one year against any defects by Princeton Violins, LLC. We love Snow instruments and this is why we have become resellers. I believe there's a great value for our clients and these instruments are certainly some of the best in their class. As a violinist and violin maker, I can tell you that these are very well made instruments with a wonderful tone and excellent playability. In our shop you will be able to play these instruments and compare them to old Italian, French and German instruments. 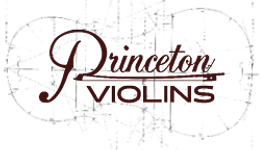 You might be surprised by your discovery at Princeton Violins. We also have a collection of Snow model violins, violas, and cellos available for rental.